Keysha Roby didn't feel well. This was supposed to be one of the happiest seasons of her life. For 16 years her husband, Willie, had dreamed of attending Rhema Bible Training College. And they were finally stepping out to fulfill that dream. But in February 2011 as she and Willie trekked through the wet Broken Arrow snow looking for an apartment, Keysha knew something was wrong. Her feet were tingling and going numb. And it wasn't just from the cold. 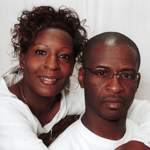 Keysha and Willie returned home, and as the weeks passed, the symptoms grew worse. She had trouble moving her legs, and her feet burned so intensely that walking was nearly impossible. "It was so bad," she remembered. "It's something you almost can't even describe." After seeing several doctors and undergoing a battery of tests, Keysha finally knew what was going on in her body—and it wasn't good. "You have multiple sclerosis," doctors told her. MS, as it is commonly referred to, affects the nervous system and causes gradual loss of muscle control. Things only get worse with time. In fact, doctors told Keysha's husband that he would have to take care of her for the rest of her life. Facing a grim future, Keysha immediately began medical treatment. She underwent grueling physical therapy and even had to inject herself with medication three times a week. "It was crazy," she said. "I thought, 'This is definitely from the devil.' "
Unfortunately for Keysha, the medication didn't seem to help much. The symptoms returned with a vengeance and began spreading to other parts of her body. She began dropping things, unable to hold them. People told her, "You're walking like your feet are on fire." Keysha had to agree. The soles of her feet felt horrible. In spite of increasing symptoms, Keysha and her husband didn't waver in their decision to move to Tulsa so he could attend RBTC. Those who knew them—even faith people—were in disbelief. As if the situation wasn't bad enough, Keysha also began to experience severe shoulder pain. In August, doctors told her she had a massive disk herniation and would have to undergo neck surgery as soon as possible. In September, after she and Willie moved to Tulsa, Keysha had a successful surgery. The shoulder pain immediately disappeared. However, the multiple sclerosis remained. Even as Keysha faced hell on earth, God was making a way for her. Before she was ever diagnosed, her husband had encouraged her to read books he'd gotten from Rhema. Of all the subjects Keysha could have begun with, she chose healing. Before her study, she didn't even know that healing was part of redemption. Keysha had been encouraged by what she had gleaned from books by the Hagins, and after her diagnosis, she dug even deeper into God's healing Word. In November, she began to regularly attend Rhema Healing School. Though she had learned much about divine healing, she still had questions. And those questions brought doubts. Healing School answered all of Keysha's questions. "I didn't have any idea that I would be encouraged so much," she exclaimed. "They taught me about forgiveness, love, and how to keep my healing. Not only did I get the Word, but they ministered to me one-on-one. They laid hands on me. It blessed me so much!" Finally, Keysha began to grab hold of her healing in Christ. Everywhere she went, she told people, "One day, I'm going to be ministering with my husband. I'm going to tell people how I was healed of multiple sclerosis." Though many thought she was crazy (there's no medical cure for MS), she didn't stop. With determination like this, it's no surprise what came next. Keysha began to notice a change—a reversal—in the MS symptoms. In December, she told her doctor she was stopping the medication. (She'd known for months it wasn't helping her.) "God healed me," she said. "And I want you to do another test." "I was HEALED of multiple sclerosis!" Though the doctor reminded Keysha, "Nobody gets healed from MS," she persisted. In January 2012, she underwent the same grueling tests that had led to her diagnosis. One test required that she be strapped to a table and flipped upside down while they withdrew fluid from her back. It was far from pleasant, but the results were worth it. On February 12, 2012, Keysha's doctor called her at home with the good news—"Your results are normal." "I was so excited," Keysha remembered. "Doctors look at you strange when you say you're healed. But these tests proved it! "As soon as we made the decision for my husband to attend Rhema, the devil got busy," Keysha continued. "Obstacles tried to stop and defeat us—to get us off the path we needed to be on. But we just kept standing on the Word of God. "That's what Rhema taught us—to never quit. We didn't give up on the Word, and things turned around!"